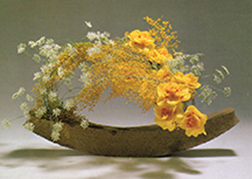 Ikebana Asheville - PROGRAMS All of our programs are free and open to the public. We would love to have you as our guest. All of our workshops after the programs are only for members. All of our programs are free and open to the public. We would love to have you as our guest. All of our workshops after the programs are only for members. "Japanese Temari - A Colorful Spin"
The presentation will be the history of the Temari (thread ball) and how it developed into an art form, a toy for children, and became an important part of womens' lives. Roberta will show the different stages of development in wrapping and stitching the ball. 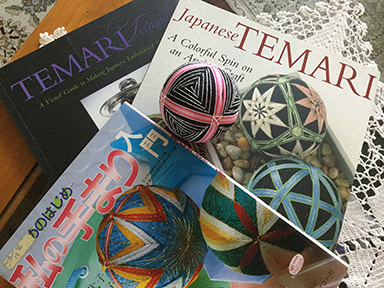 She will have several books for all to look through and will have a few Temari balls to see and touch. Depending on how quickly the demo goes Roberta may also demonstrate fabric wrapping in the Japanese way. 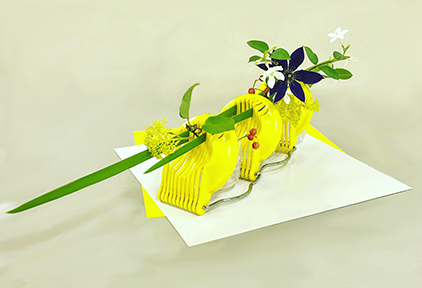 "Ikenobo Free Style with Kitchen Utensils"
Do you know how to make ikebana with and in kitchen utensils? Experience the original and most formal of the ikebana schools, Ikenobo, embracing modern free style creativity using unusual choices for containers - everyday kitchen utensils. 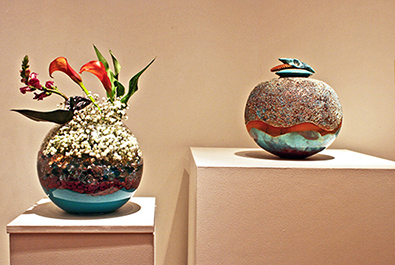 Emiko will artfully demonstrate surprising new angles for ikebana containers. "Using Fresh and Unconventional Materials"
Making a composition using fresh and unconventional materials can be challenging. "Unconventional Materials" means anything other than fresh plant materials. Dried, colored, and other materials which are made by processing originally fresh plants are not considered to be unconventional materials. 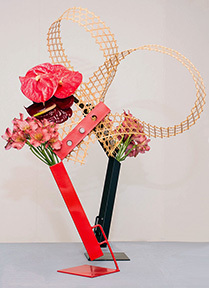 Each designer will do two arrangements using unconventional materials. 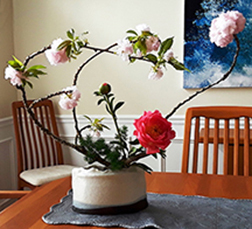 "Having Fun Being Creative - Interpreting Art for Art in Bloom"
Each designer will share how they interpret and enhance a piece of art as an "Art in Bloom" ikebana designer. 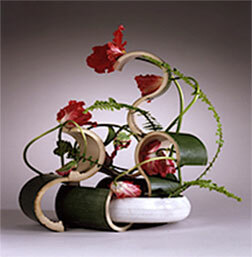 Let's have fun sharing an art object, interpreting it using ikebana floral materials that you bring and then share and explain your interpretation. 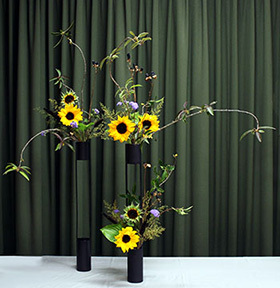 "Summer Flower Materials from the Ohara School of Ikebana"
Diane will create 3 different arrangements - Bunjin-Heika using a tall vase with a fitted base, a Rimpa with a focus on June flowers, and a Middle View Landscape which shows Far View, Middle View and Near View. This will be a wonderful demonstration of how Ohara uses summer flower materials. 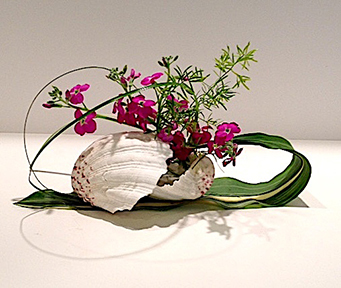 "Emphasis on the Color of the Container in an Ikebana Arrangement"
The essence of ikebana lies in the relationship between flowers and the container. 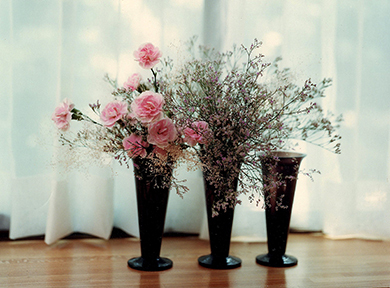 By focusing on the container to be used, new ideas of composition may come to mind. 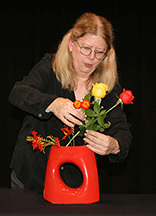 For the program, Susan will make several compositions with color in the same tonal range and colors in contrast to the color of the container. A "Friendship Through Flowers" workshop will follow which will be open to members and non-members. Each participant will supply the container that they will use and the materials for their composition. A nominal fee of $15 for the workshop will be donated to the chapter. 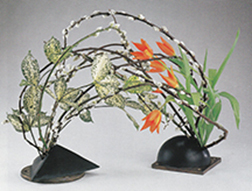 Program: "80 Years of Ichiyo Ikebana"
Mail check for $50 made out to Ikebana International Asheville Chapter #74 Send to: Diane Harker, 4 Foggy Ridge Way, Travelers Rest, SC. 29690 before August 16. Specifiy vegetarian quiche or salmon dish for lunch choice. These two workshops are only ﻿for I.I. members of all chapters. Mail check for workshop/workshops/lunch that you want to attend made out to Ikebana International Asheville Chapter #74 Send to: Diane Harker, 4 Foggy Ridge Way, Travelers Rest, SC. 29690 before August 16. If you want to have lunch ordered for you add $15. Choices TBA. Placing contrasting materials on the left and right sides of an arrangement gives students a new understanding of the drama that can be created by contrast. Three different materials will be provided for this workshop allowing for many contrasts among the elements such as color, surface, line and size. "Strong Mass and Soft Mass"
This free style workshop will explore different ways of adding interest to compositions through the interplay of opposites. Two materials with volume differences will be used which will show the contrast required in this style. ﻿Tips for installing better seasonal exhibition arrangements that look fresh longer will be the focus of this demonstration. 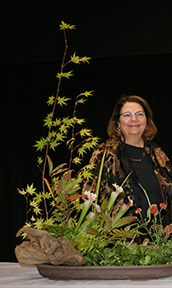 Fall materials will be featured to inspire ikebana artists for the 18th annual Ikebana International Asheville Chapter #74 exhibition at the Carolina Bonsai Expo at the North Carolina Arboretum October 12-13, 2019. 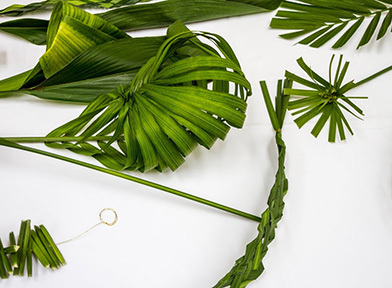 Suzanne will create several designs using leaves manipulated in different ways. 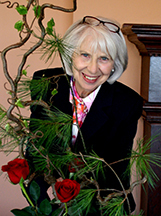 A "Friendship Through Flowers" workshop will follow and is open to members and non-members. A nominal fee of $15 for the workshop will be donated to the chapter. 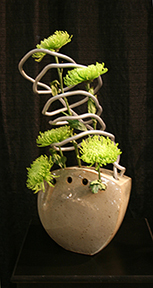 Copyright 2010 Ikebana Asheville. All rights reserved.